I arrived in Singapore on Sunday, which happens to be market night in Little India. Set within an sea of ultra modern buildings, super high-tech and non-stop advertising, Little India is one of the few places in the city which still has some character. That’s even more true during the Sunday night market. I took a walk through the busy, colorful streets full of people and fresh fruit and vegetables for sale. In a gap between the crowds I spotted a sign for a vegetarian restaurant called Ananda Bhavan and decided to have a look. And, in my experience, that’s really the key – keeping it as raw as possible. I believe we are physiologically designed to be vegetable and fruit eaters – raw vegetable and fruit eaters. 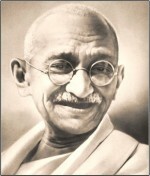 So, if Mr. Gandhi’s analysis and words resonate with you and you feel pulled to try a vegetarian diet, I’d encourage you to lok toward a raw vegetarian diet first.